1. In the past week, I've been asked about bitcoin by a parade of the least-knowledgeable investors imaginable – and the only times such foolishness has happened before in my 18-year career were at the peak of the internet and housing bubbles, so I'm calling a top right now. Blockchain technology is real in the same way that the internet was real back in 1999 and housing prices tend to go up in the mid-2000s – in other words, a good idea taken to absurd extremes is NOT a good idea! That said, the greed and speculative nature of humans is inherently unpredictable, so for all I know bitcoin could go to $1 million. But I do know the ultimate outcome: smoldering rubble, a lot of finger-pointing (where were the regulators?! ), and a lot of tears and empty bank accounts, especially among those who can least afford it. I don't often quote our Malignant Narcissist in Chief, but I will here: "Sad... "
2. Trust me: run, don't walk, to watch this hilarious, clever four-minute Daily Show segment on bitcoin and other cryptocurrencies: The Rise of Bitcoin and Other Stupid Meme Currencies, https://youtu.be/nRItzSX0aCM. "Cryptocurrency: is it some fake sh*t some fu*king nerds made up on the internet to steal our money, or is it the future of finance? There's no way all these people buying cryptocurrency have any idea what the hell they're investing in!" CNBC guest: "If you imagine bitcoin as a gold coin, Ethereum is a coin that has a magic spell in it." Chieng asks Joe Luben, co-founder of Ethereum: "Why do so many suckers on the internet, excuse me, sorry I mean people, believe fake money has value?" He played it straight, answering: "Ether is real... "
Chieng says "This is America, so I decided to create my own cryptocurrency, but that has to be an incredibly complex... " [on the screen, he goes to a web site called "Create your own Cryptocurrency" (I just Googled it and there are 1.83 million hits!)] and concludes: "I did it! It literally takes 10 minutes to go on a website and create your own coin." Then he tries to pay a sidewalk hotdog vendor and a taxi driver with his new Chieng-coin, and when the taxi driver throws him out of the cab, he lectures him: "Remember this moment, when you had a chance to jump on Chieng-coin and you didn't!" – hilarious!!! The loss raised more questions about the future of this former Wall Street rock star. Possibly more than any hedge fund manager, he created the era of the swaggering activist who could move markets simply by going on CNBC and announcing his presence in a stock. Now people are asking: Can he recover the hedge fund world's esteem — or has his reputation been permanently tarnished? Ackman, known for an abundance of self-confidence and an exuberant ego, is having none of that. He says ADP will have to make good on promises it made to shareholders in order to win the proxy contest, or he'll put up a slate again next year. "Now management is being watched very carefully, and the ball is in their court," he notes. The hedge fund titan, whom Forbes estimates is still worth $1.3 billion, vows to come back. Investors who are sticking with him, as well as fellow activists and other hedge fund managers — including some who have criticized him publicly but declined to go on the record for this article — tend to agree. "He didn't get dumb overnight, and at some point he will find something really great and he will make a lot of money for investors," says a major investor in Pershing Square who has been there since the early days, adding, "Everyone is down on Bill Ackman, so he's the contrarian bet." Ackman, who relishes being a contrarian, is by turns defensive, apologetic, and adamant. Wearing a crisp blue-striped shirt with the sleeves rolled up, he keeps his arms crossed for the first half-hour of our interview, insistent that the ADP vote could eventually turn into a big win. "We lost the battle, but we expect to win the war," he says. The normally upbeat activist becomes more animated as he pledges to make investors whole and to bulletproof the firm. "Are investors unhappy with our performance? I'm unhappy with our performance," he says excitedly, his eyes popping as his arms open wide. "But if I recover the way I expect to from this, Pershing Square becomes much, much stronger. We're never going to challenge it again." There will be "no more Valeants," he adds. On a pitch-black winter night in San Diego, California, Bill Ackman and several friends slipped into wet suits, boarded a van to a nearby pier, jumped into the frigid waters of the Pacific Ocean, and swam toward a distant string of lights. Forty minutes in, one of the activist investor's friends got a cramp and started to scream. "This is the kind of stuff where people drown. I thought I was done," says Robert Jaffe, founding partner of hedge fund Force Capital. Another hedge fund manager, Kase Capital's Whitney Tilson, survived the ordeal by crossing his arms over his chest to hold in body heat. "There's nothing more frightening than swimming in the ocean at night," he says. 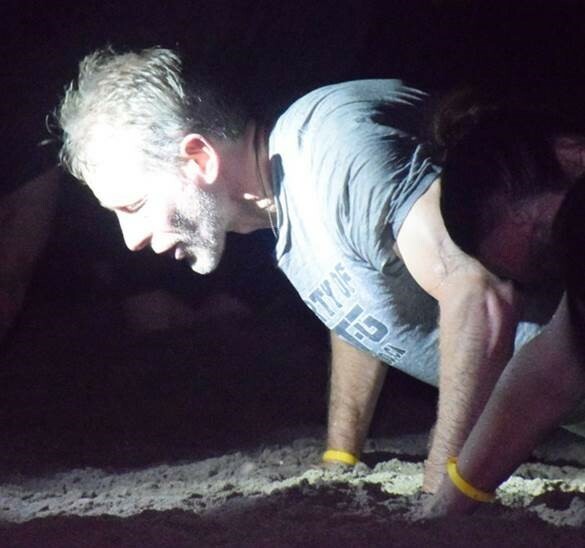 Tilson, a friend of Ackman's from their days at Harvard, had suggested the outing, an arduous three-and-a-half-day training camp with a group of former Navy Seals who bill it as a leadership course and call the night swim a "face your fears" challenge. Ackman thought it "sounded kind of cool." He convinced 22 friends to join him. I sure was miserable right then – but I can tell you that after those two weekends, it now takes a lot for me to feel upset about anything: Caught in the rain without an umbrella and get sopping wet? Ha! Forget my jacket at home and am freezing? No problem! Go 14 consecutive nights without a good night's sleep, averaging ~4 hours per night (I'm hopefully at the tail end of that right now, though tonight will be my 15th tough night no doubt, as I'm about to go to a wedding)? Piece a cake! (See my 6 slides on this – attached and posted at: www.tilsonfunds.com/Tilsonsleepdeprivation.pdf). 3. 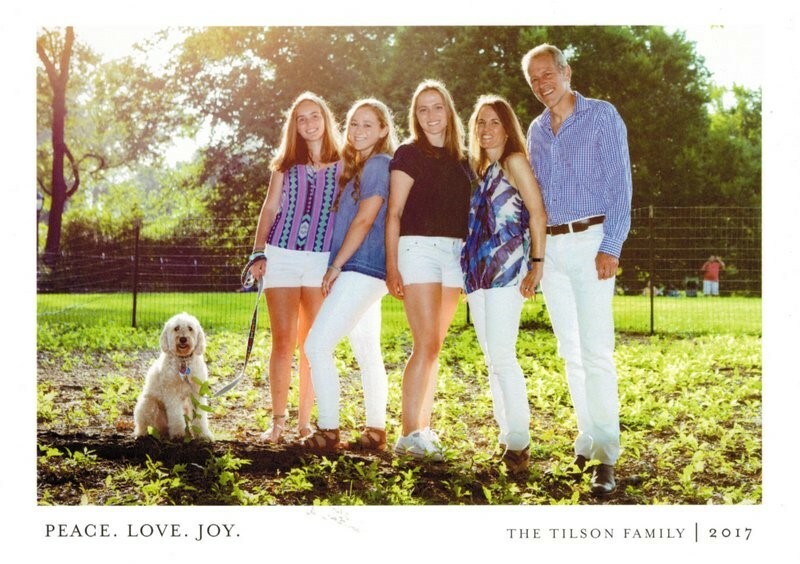 Here is our holiday card. Happy holidays! 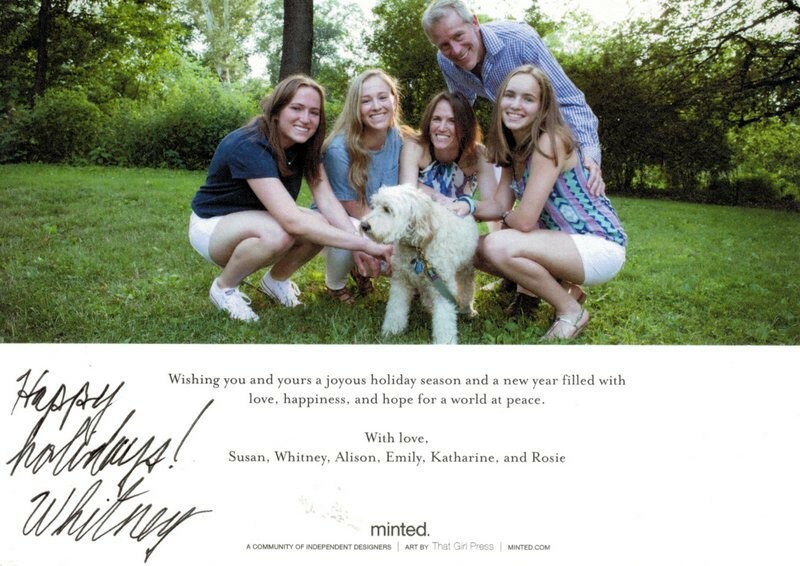 PPS – If you're looking for a beautiful photo and cards (and live in the NYC, SF or LA areas), check out the new service my cousin created, Photo Op By Minted, which marries Minted.com's holiday cards with an inexpensive way to get professional photos. Minted will send a professional photographer to your home (or anywhere you want), any day of the week, for a 30-minute photo session. You'll then receive 10 expertly retouched photos, access to view and download all photos from your session, and complimentary styling of five holiday cards, all for only $100. We did it a couple of months ago (as beta testers) and LOVED the photos we got (and used them for our holiday card)! 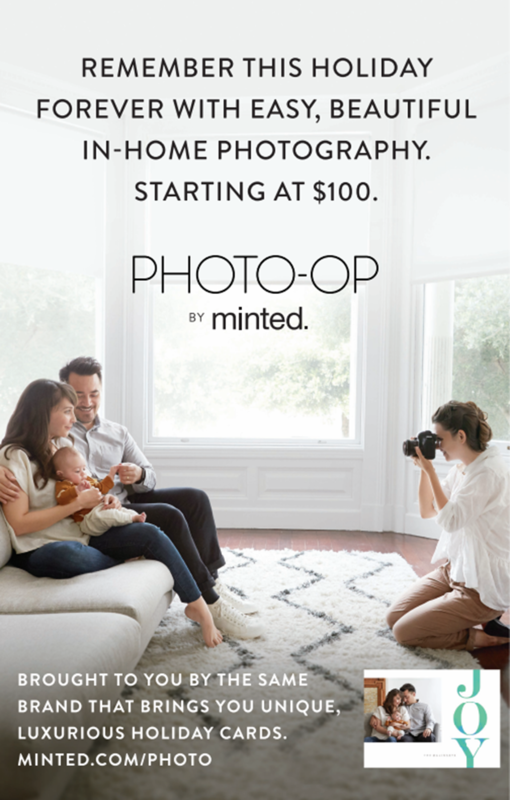 You can learn more and sign up at: www.minted.com/photo-op. Please let me know how it goes and I'll forward your feedback to my cousin!